Dark portents aligned to make Catelyn, Robb, and Edmure’s trip to the Frey’s castle ominous, including the endless rain and Robb’s direwolf’s jumping in his cage. Catelyn Stark mistrusts Lord Frey and frets he is leading them to a trap. But, did historical events inspire George RR Martin when he envisioned the Red Wedding? To pen the Red Wedding Martin takes a page from a real-life event in medieval Scottish history known as the Black Dinner and may also have been inspired by the Skirmish at Heworth Moor, which I’ll cover in the next blog post. This anonymous posthumous portrait shows James II as an adult. You can see a very faint reddish mark on his far cheek. This image is now in the public domain and the portrait resides at the National Galleries Scotland. Naturally, regents ruled for the boy king. Originally, the Earl of Douglas, Archibald Douglas, governed for the boy. But, after Douglas died from the plague, few high-status nobles existed to take his place – James I had decimated most of the nobility. Instead, two rough opportunistic men uneasily shared control between them: Sir William Crichton and Sir Alexander Livingston. But these men feared that Archibald Douglas’ sons would destroy their dominance. Archibald Douglas’ heir was his fifteen-year old son, William. A handsome ambitious and haughty youth, the young earl was about to become Scotland’s greatest magnate with a force of 5000 knights and spearmen. Worse, the boy-king James idolized William, who returned the adoration. Crichton and Livingston knew this potentially overmighty earl could easily topple their rule, so they joined forces to extinguish this threat. While historians differ on whether or not what happens next is legend or fact, one account similar to the Game of Thrones is the one in Victorian history The Black Douglas by Samuel Rutherford Crocket. Crichton and Livingston invited Earl William and his younger brother, David, to feast with the king at Edinburgh Castle on November 24, 1440. When Earl William and his brother arrived, they were treated with the utmost courtesy, almost too much in fact. Laid out in the banqueting hall, an oblong chamber with oak ceilings with enormous gilt-silver moldings, the boys dined in the French style. The band sat in the gallery at the Game of Thrones’ Red Wedding. (c) HBO. The soldiers seized the earl and his brother. Despite the boy-king James’ protests, a hasty kangaroo court condemned the boys of treason. Soldiers forced the boys into the courtyard where an execution block was already in placed. The Earl William begged for his life and that of his brother David. Then, when this was refused, William requested his younger brother be executed first so that he did not have the wrenching experience of witnessing his elder brother die before him. James I wept as his friends were beheaded, but he was helpless to stop it. 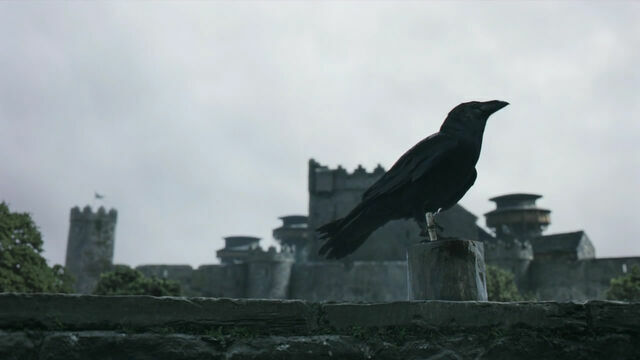 In the episode, the musicians began playing the “Rains of Castamere” a threatening song in Westeros right before Lord Walder began his executions. Yes, exactly. I thought it was really neat that George RR Martin used the idea of music being a prelude to doom before the attack began. (Even if he wanted to, George RR Martin definitely couldn’t use bagpipes because those are strongly associated with Scotland, a place that doesn’t exist in Game of Thrones.) The “Rains of Castamere” is a Lannister song celebrating the Lannister’s destruction of the House of Reyne, who rebelled against them. Consequently, the song signals the Lannisters are about to destroy another house (or nearly destroy it). Maybe I should have been clearer in the blog post. Sorry about that. Best regards and thanks for reading and commenting! Hello Jamie. As a Scot , I just wanted to point-out that while Scotland does not exist as such in Game of Thrones ( nor of course do any real-world countries ) , George R.R. Martin has compared the North to Scotland. In the TV adaptation this is broadened to Northern Britain in general. If I may say so ,you have a great site here .I am so glad to have subscribed. Thank you very much for your kind words and welcome! I didn’t realize that in the TV adaptation the showrunners had broadened the Game of Thrones North to Northern Britain in general. That’s really interesting. I’m fascinated by the (real-world) history of the North in general, and especially the wars over the northern marches. Thank you for subscribing – it is wonderful having enthusiastic readers like you! Please do more about Romans, Greek, Knights,Jacobites, Celts, Vikings, Anglo Saxons and have a look on other websites if you need to see real life examples. Not Hunger Games, this sites is Game of Thrones. Thanks for the feedback. I suspect based on this, you would be interested in articles that parallel real-life examples (like filming locations)? Actually, George RR Martin mentioned the Balck Dinner, alongside with the Massacre of Glencoe, as the main sources of the red wedding (see http://www.nerdist.com/2013/06/george-r-r-martin-explains-the-red-weddings-historical-roots/ ). I always thought that the most obvious historical parallel is St. Bartholomew’s Day massacre in which the guests of the royal wedding were slaughtered by their hosts in Paris. In Sweden, my father’s country, we have a historical episode called “Stockholms blodbad” (the Bloodbath/Massacre of Stockholm). It was in the late Middle Ages, when all of Scandinavia was one single kingdom ruled from Denmark and by the Danish. The last king of unified Scandinavia, Christian II, was a father to his own people, but a tyrant to the nobility and populace of Sweden. So the Swedish lords started uprisings against the foreign oppressor. Then, suddenly, the King announces that he will make peace with them, and that they should parley and celebrate at the palace in Stockholm, now that there was peace. Peachy! So they all go to court, unarmed, confident There are all the rebel leaders. And then, the King locked them in the banquet hall, of which every window was bolted. And then, the Swedish lords were, every one of them, intoxicated, unarmed and trapped, then slaughtered to the last man by Christian’s soldiers. Gustavus Vasa had three sons: Eric, John, and Charles. The eldest, who became king after him, was unlucky in love, loved a well-set table, big game hunts, and wenches. More wenches! He died after consuming arsenic-laced pea soup. And, needless to say, Charles IX burned and broke all the religious images (which to him were false idols, and to his brother were works of art) in Sweden. Eric XIV reminds me of Robert Baratheon. House Jagellon of Poland: House Tyrell of Highgarden. Catholicism: Faith of the Seven. Protestantism: Faith of the Lord of Light. The self-indulgent eldest brother (Eric/Robert) was first to die. While destroying religious images and carrying out violent repression of (Catholic/believing in the Seven) opponents who refuse to accept him as king, branded as traitors and heretics, to legitimize his claim to the throne on religious grounds, in the name of (God [Protestantism] / R’hllor, the Lord of Light). The parallels between the Baratheon and Vasa cases cannot be clearer. But how will this neverending story come to an end? Notably, both Charles IX and Stannis Baratheon were hard as iron, yet the fact that they had hearts was highlighted by the way they treated their young hopefuls. While both Stannis and Charles are being asked to confront their actions, they are giving their children, of whom they have great expectations to do what the fathers never could themselves, the best education and lots of loving care. Shireen is as loved by her father and as encouraged to learn as a child Gustavus Adolphus once was. And we all know what a wonderful person (brave, clever, kind, quick-thinking, righteous…) Gustavus became upon coming of age. It must have been for a reason that an unusually emotive Charles IX liked to stroke his eldest son’s golden hair as he said “Ille faciet”: “He shall do it”. The same thoughts may be on Stannis’s mind, though in feminine, obviously. Not knowing myself the Valyrian words for “She shall do it”, I would wish to express it as “Illa faciet”.